LOCATION.--Lat 41`07'03", long 78`06'33", Clearfield County, Hydrologic Unit 02050201, on left bank 900 ft upstream from bridge on State Highway 879 at Karthaus, 1,000 ft upstream from Mosquito Creek, and 3.3 mi downstream from Moshannon Creek. Records include flow of Mosquito Creek. DRAINAGE AREA.--1,462 square miles, includes that of Mosquito Creek. GAGE.--Water-stage recorder, crest-stage gage, and water-quality monitor. Datum of gage is 830.59 ft above National Geodetic Vertical Datum of 1929. 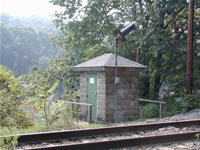 Prior to Sept. 30, 1920, non-recording gage at site 900 ft downstream at datum 20.88 ft lower. Feb. 21 to Sept. 30, 1940, non-recording gage at site 900 ft downstream at present datum. Satellite telemetry at station. Supplied by NWS: Action stage-16 ft; Flood stage-19 ft, the left, or west bank overflows; Moderate flood stage-22 ft, several homes in low lying areas near Mosquito Creek are affected; Major flood stage-24 ft, a number of homes are affected by high water.